Referral Program — ACMA developed the Referral Program to encourage Fellows to refer business to other ACMA Fellows. Referral Directory — ACMA Fellows are listed in our online referral directory that is used by individuals and companies to "Find a Mortgage Attorney." The Abstract — Published twice a year, The Abstract keeps Fellows informed of the latest happenings in the industry — from articles on topics affecting their practice, to alerts on statutory, regulatory, and case law developments. Continuing Legal Education (CLEs) — Fellows can receive CLEs from attending ACMA conferences/meetings. 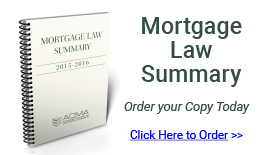 Mortgage Law Summary — Every Fellow receives one free copy of the Mortgage Law Summary, updated every two years, which covers laws for each state or province when engaging in interstate mortgage transactions. Discounts — Fellows receive steep discounts on the purchase of additional copies of the Mortgage Law Summary. State & Provincial Chairs — Fellows have access to all ACMA State & Provincial Chairs who are ready to answer questions regarding their state or province as it relates to the mortgage industry. Knowledge Bank — Fellows all have access to ACMA's "Knowledge Bank" — a resource portal of archived articles from The Abstract, conference presentations, useful industry information, and more. Roster — Fellows receive a free copy of the ACMA Roster every year which lists contact and specialty information for every ACMA Fellow. Networking — Membership in ACMA provides Fellows with outlets to share ideas and build relations with the industry's top mortgage attorneys. Educational Opportunities — ACMA provides outstanding educational programming that keeps Fellows on top of the latest developments impacting mortgage law. If you are interested in becoming an ACMA Fellow and do not have a nominator, please contact an ACMA Fellow within your state or province for further details. If you have questions about the process, please contact acma@mgmtsol.com. Please note: The Membership Committee meets once annually in March, at which time nominations for new Fellows are reviewed. The deadline for nominations is typically mid-February.